Last year I had a chance to visit Mahakuta Temple at Bagalkot District of Karnataka, with a large group of friends. The temple is located in the small town Mahakuta, 14 kms away from Badami, in a hilly area. 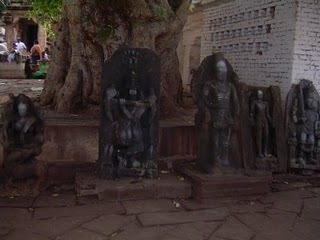 Mahakuta was once a great center of shaiva cult. It has a distinct structure that isolates itself in size and architecture from other Chalukyan temples. This place is often called Dakshina Kasi because of its religious importance. The enclosure in which the Mahakuta temples lie is reached by a steep flight of stone steps, at the foot of which is a doorway guarded by door-keepers said to be figures of the demons Vatapi and Ilval. These large and wide steps really reminded me of a bygone era. Even though it is such an old temple built by Chalukyan dynasty in Dravidiyan style, dated to the 6th or 7th century, daily pujas are still conducted here in the main temple. They also have an annual mela which brings in people in large numbers. As we walked around the temples we were surprised by the interiors. In the courtyard, there are 15 small temples with intricate sculptures. have spread their tentacles all around. Because of this, sun is hardly seen there. Another interesting feature is a little fresh water pond in the main courtyard, called Vishnu Pushkarni. 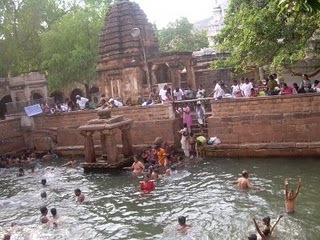 This pond is said to have been constructed by the sage Agastya. In the masonry margin of the pond is a lingam shrine,the entrance to which is under water, and in the pond is a chhatri containing a four- faced image of Brahma. Since bathing in the pond is allowed, many of my friends got into the pond and enjoyed swimming and bathing in the cool water. The pond has a spring emerging from the ground which keeps the water fresh and clean. We walked around the inner walls of the temple visiting each of its shrines, and observing the leafy gopuras and the tentacles of the trees. 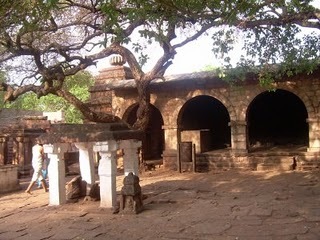 There is a Lingam in the sanctum, surmounted by a storeyed tower with an octagonal domed roof. The best carvings can be seen on the basement frieze, which has the intridcate work of figures from the Hindu epics. In the wall niches you can see large images of Shiva. No one can leave the place without peace and a complete feeling of fulfillment. (at least for some time). Many of us wished we had time to spend a whole day there in that serene atmosphere!! Your clear, sparkling words and the marvelous photographs make me want to go there. Thanks Sumit for reading this travelogue and I'm glad you found it useful. It is well worth a visit. Thanks Vimala for reading the article. 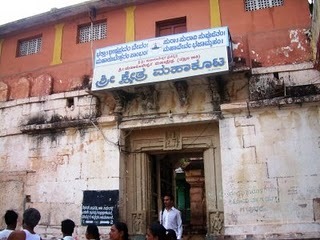 I found this information while searching for more about Mahakuteswara temple. A very informative blog. But, tell me, there is only ONE Kashi, but so many claims for DAKSHINA KASHI. Thanks Geethashree for your visit and wonderful comments. I do agree with you all religious places won't invoke the Bhakthi feeling in everyone. I too belong to that group. But in Mahakutir I really felt a very good feeling, probably due to the special atmosphere of the place since it was set in a hilly area, and the serenity there, added with the clear water of the pond. Your visit to Mahakuteshwara Temple reminded me of my own to a temple in Burdwan a long, long time back. I do not much remember about the sanctum sanctorum. Perhaps there was none. But a peculiar feature of the site was a huge courtyard filled with 108 Shiva Lingas of different sizes varying from the huge to the miniscule. I do not remember who built the temple but it was one of the famous sites of Burdwan District. However, it was the only place where I was not overcome by Bhakti Bhaav, sorry to confess. But definitely a feeling of awe on citing so many Lingas at one place; it was quite overpowering. It is my experience that all temples and devotional places do not evoke similar response or feeling.